Compare timesheet software with this scorecard spreadsheet. Free. Time to evaluate and compare timesheet software and choose the best one for your business. We know the feeling. If you’re reading this, we guess that you’re almost -if not totally- convinced that having an effective way of tracking and managing the time and work of your employees is an asset that comes with significant value for any organization. However, not all the companies have the same needs…so let’s roll our sleeves up. How to compare timesheet apps? The quintessential questions. Are you satisfied with the productivity of your company? Do you have a good idea about the amount of time that could be optimized in your organization? How do you feel about payroll and HR-related processes? Do you have the impression that your employees spend too much time filling out timesheets and time-off requests? Do you have an accurate idea of the time that each employee invests in group meetings? Does your time-off management runs smoothly? Is there a healthy planning strategy in the projects your company handles? Now, have you really asked yourself and the people involved these questions? Reduce the burden of you payroll and HR staff. Save money in administrative costs. Be able to distribute better the time of your workforce across various projects. Get a clean understanding of the availability of each one of your employees. Improve your billing through effective time tracking. Measure the performance of your organization with a whole variety of reports. Provide a time tracker solution for your remote/mobile employees. Don’t be afraid to come up with a long list of goals. However, avoid being vague about it. Having a list of very specific goals will help you a lot during the process of choosing your product. While each company has its own needs and reasons for buying this kind of tool, the following must-have features will definitely enhance the impact of your product. Get our scorecard to evaluate timesheet systems. It's free as in 'free beer'. It may be that you just want to have a timesheet system because you want to have a better idea of how productive your employees are. However, a good timesheet tool is something that goes way beyond time tracking. In fact, you need to look for products that allow you to handle various aspects of your organization such as project reporting, billing and budget planning, just to mention a few. When we started back in 2009, there were just a few apps in the cloud offering this. Now there are hundreds, but they all have similarities and differences (get free comparative reports here: timesheets alternatives). When it comes to timesheet apps, there’s nothing better than the cloud: Here you would need to check if the tool offers backups, exports…or if it has a mobile app that works across devices. Maybe your company has a growing mobile workforce, and you would need a timesheet app that actually works offline when on-the-go. Easiness of use comes extremely handy – if not key – for a process that, like it or not, might cause some adoption reluctance among employees. Because of that, it is crucial to get a product that is easy to use for you and your staff. With a user-friendly system, you will be able to run the most important processes of your organization smoothly. Make sure your product comes with a free trial period that allows you to fully test all the features. If you have a dynamic business, you want to get a system that is flexible and easy to adapt to new circumstances. A system with a high degree of customization is a great management tool. In fact, you should try to look for apps that come with customizable dashboards that allow you to easily create your own KPIs or set specific permissions at different levels within your organization. Even if the app is easy to use, you should try to get a product from a vendor that provides solid customer service. Make sure to test that aspect during your free trial period and favor those vendors who provide solid and timing support through email, phone or live chat. If you are already using some kind of software for your business, keep in mind third-party integrations. Check whether the tool offers some sort of API or integration automations for your development team, if needed. 7. What do other people say? Make sure to spend some time reading product reviews from authoritative and reliable sources. For instance, you can take a look at sites like Capterra or Picksaas where you can get real and useful reviews. Also check what type of companies these time-tracking apps have as customers and for how long the product has been on the market. This proves a solid product. 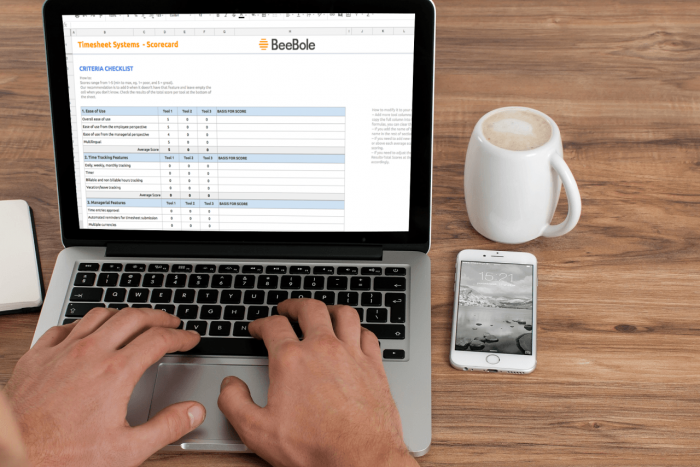 Compare timesheet systems with this free scorecard spreadsheet. As you can see, choosing the “best employee timesheet tool for your company” is a process that requires… some thinking. However, if you keep in mind some of the things we mentioned, you could be a little be more prepared to face that important decision during your research, when you are searching for ‘timesheet systems comparison’ in Google or something like that, and you end up signing up and trying for yourself. Wouldn’t you like to have an easy way to score each feature and see which one is the final winner? We have prepared this spreadsheet so you can stay focused during the research & compare process. It has some formula added, and automatic scoring, plus the common list of features you can find in comparison sites like Capterra. The only thing you need to do is add your grade and let the spreadsheet do the maths. It comes with some easy instructions anyway. It will help you assess and score each product according to your own needs and goals. Let us know if it does. Check your email now.